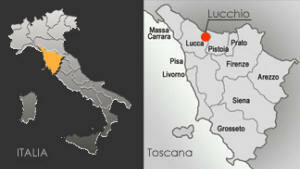 This 1:5,000 scale model of Lucchio, Province of Lucca, Tuscany, Italy was completed in 2005. It covers an area of 2,500 ha or 25 km2 and includes the old village of Lucchio, surrounding chestnuts forests, grazing lands and one active and one abandoned quarry, one waste incinerator and a hydro power plant (under construction). The context of this research done by Luca Giraldi, a student of the University of Florence, Faculty of Architecture, Department of Urban and Regional Planning, is the small mountain village of Lucchio which is semi-abandoned. The village is surrounded by pastures and woodlands which were once highly anthropized, as these represented the main source of livelihood. 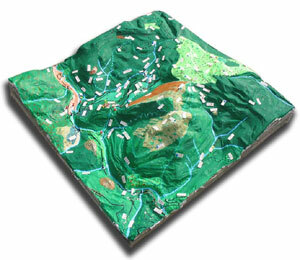 Those who contributed data to the model were local residents including shepherds, hunters and woodcutters. At present these environments have been taken over by spontaneous vegetation. Many houses are empty and crumbling. Since its era of highest economic activity the village population has dropped by 95%. 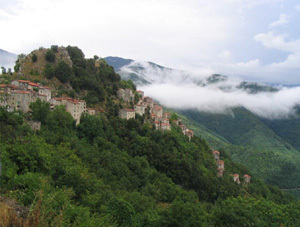 Facing the issue of abandonment that afflicts much of the mountain areas in Italy, and confronting local conflicts generated by some political choices of land management (the location of the quarries, the hydroelectric plant, composting plant, etc. 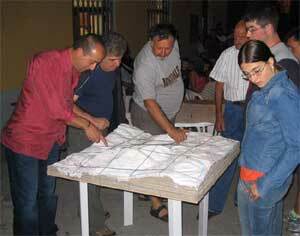 ), the researcher was wondering how local residents still envision the future of their territory. The outcome of the research is found in the thesis of Mr Giraldi (see below).